With a simple shift in mindset and a little scouting around, the utmost in sophistictated and chic design can be created from second hand. As I emerse myself deeper into sustainability I am consistently discovering incredible innovation and heart based businesses. These brands are doing their bit to support our beloved mother nature, backed by their own unique, lovely stories and let me tell you not ever does style become a sacrifice. As I learn more about the impact fast fashion has on the planet, the more I want to be mindful in all other areas of my life too. From what I eat to what I put on my skin and hair, so thank god for the insta angels because I met the beautiful boys behind The Sustainable Salon. Seriouly there isn’t enough room on this blog post to count the ways in which I love what Zoran and Diego are doing. 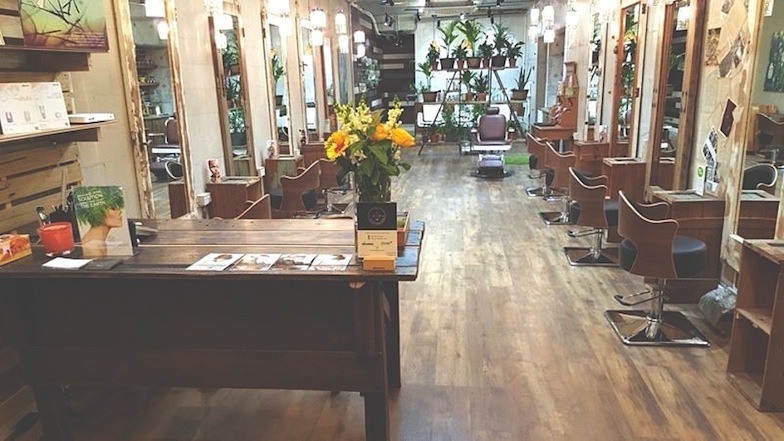 Their salon is 100% sustainable, from the products they use to their ethos and eco upcycled interior design. Think wash basins that were once wine barrels, walls covered in vintage newspapers and magazines from the 20’s to the 60’s, old door frames reimagined as mirrors, discarded timber turned into foot rests and eco chic shelving, gorgeous greenery in recycled pots and glass beakers abounds. They’ve done all the leg work themselves, sourcing their pieces from the side of the road, markets, ebay, second hand havens and op shops. They recycle absolutely everything, their plastics, paper, packaging, metals, the hair even the bowls they mix their chemical free dyes in are made from coconut shells! The also have a fantastic water saving solution system built into their salon powered by Tivok. So I knew I had to do a 100% eco fashion shoot here, this place is my spirit animal! Eco interiors, Eco Hair (hello Diego’s 1950’s Hollywood finger waves) Eco clothing from Salvos Stores and Eco accessories by Zefyr Jewels…just to show you that second hand never has to mean second best, it can and should be ineffably chic.